Milan is the second most populous city in Italy and is known for many things. The Capital of Fashion is a mixture of old and new, offering extraordinary sightseeing, engaging shopping, fine dining and much more. Some landmarks of Milan, such as the Duomo, are among the most recognizable structures in the world. Also, the city used to be home to Leonardo Da Vinci, one of the most innovative and brilliant personalities in history. Finally, the capital of the Italian province of Lombardy is home to FC Milan, one of the most famous football clubs throughout the world. To explore the city of Milan efficiently and conveniently for a limited time you have, consider joining sightseeing tours by bus. Depending on what interests you, choose among three routes taking you to historical attractions, modern sites or places related to sports. You are also free to combine all of them and discover the entire city in several hours. While on board, make use of wireless internet and audio commentary in several most-spoken languages worldwide. Finally, personalize your experience by taking off the bus at any available stop and rejoining the ride whenever you wish. Line B: Every 45 minutes from 9.45 to 6 pm (Summer), 10.00 to 16.00 (Winter). Line C: Every 90 minutes from 10.35 to 16.45 (Summer), 10.15 to 16.15 (winter). 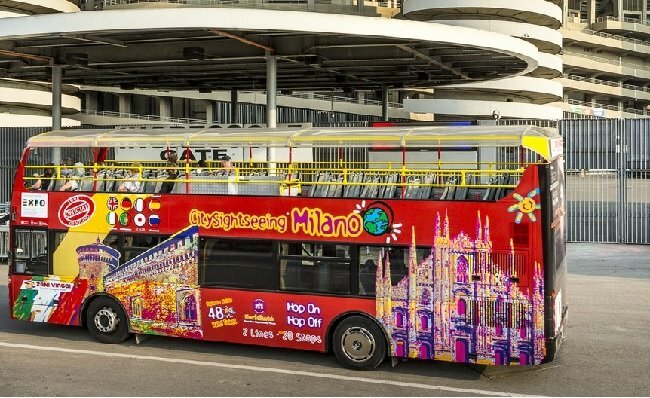 We are comparing Milan Hop-on Hop-off Bus Tour, Map, Prices from leading ticket suppliers and Try to find you Cheap tickets prices on the market. Make the most of your visit to Milan and travel stress-free with the Hop-On Hop-Off 24 or 48-hour pass. No need to figure out the maze of metro lines or city bus timetables because the Hop-On Hop-Off bus keeps things simple. There are 3 lines, A, B and C and 6 buses which will take you to separate areas of Central Milan. All 3 lines begin at the same point, Castello. Around the city centre there are several stops, just look out for the red double-decker buses. The full loop takes approximately 75 minutes but you're welcome to jump off at any of the marked stops, grab an espresso in the bohemian streets of the Brera, run up a bill shopping at Galleria Vittorio Emanuele II or pay a visit to the Madonnina, standing on Duomo's rooftop overlooking the city. These tour buses are ideal for all ages, when you've had enough of sitting, jump off and when you're tired of walking jump back on. The Hop-On Hop-Off buses take you within a few minute walk of all of Milan's top attraction and museums, as well as many of the city's lesser known historical and cultural gems. This is for visitors who want a convenient city tour without sacrificing a flexible itinerary. The Hop-On Hop-Off bus pass lets you travel the city on your own time and stress-free. If you're travelling with children, seniors, or disabled then this is a convenient option. Your Experience With Milan Hop-on Hop-off Bus Tour, Map, ? Travel around the centre of Milan with ease and flexibility using a 24 or 48-hour Hop-On Hop-Off bus ticket. Listen to an audio guide in 8 languages or relax on the open top bus, enjoying panoramic city views. Make your own itinerary and use this convenient bus service to visit the best sights and attractions Milan has to offer. 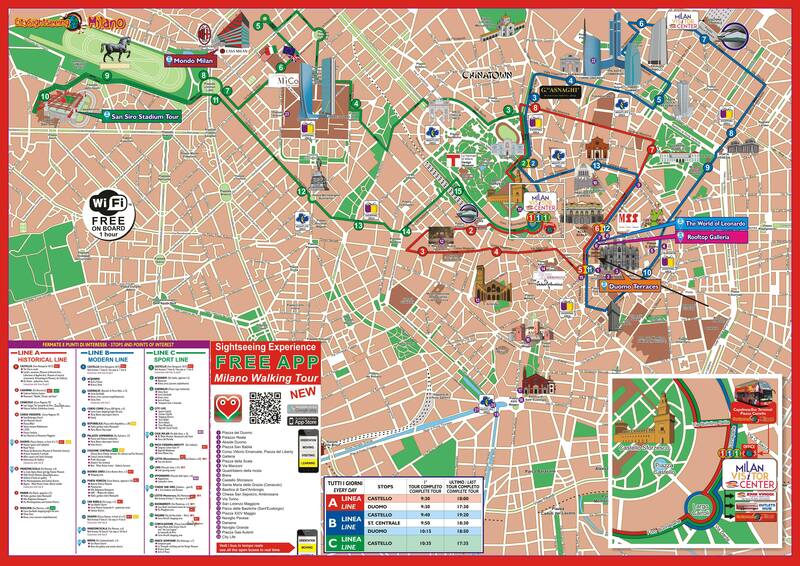 What Milan Hop-on Hop-off Bus Tour, Map, Includes? 24 or 48 Hour pass to Milan Hop-On Hop-Off buses. Engaging audio guide in English, Italian, Spanish, French, German, Russian and Chinese. Line A (8 stops): Mocsova, Manin, La Scala, Duomo, Corso Magneta, Cenacolo, Cadorna, Castello. Line B (14 stops): Castello (start/finish), Berea, La Scala, Duomo, San Babila, Porta Venezia, Buenos Aires, Central Station, Palazzo Lombardia, Repubblica, Corso Como, Garibaldi, Triennale. Line C (16 stops): Castello, Parco Sempione, Concoloazione, Pagano, Buonarroti, Monterosa, Stado San Siro, Ippodrom, Lido, Montobianco, Fieramilanocity, Congress Centre, Casa Milan, Sempione, Garibaldi, Acquario, Castello. If you will stay longer in the city then the 48-hour pass is better value. Travelers Reviews about Milan Hop-on Hop-off Bus Tour, Map, ? This Hop-On Hop-Off sightseeing bus has 4 out of 5-stars on TripAdvisor and Viator. It has a positive 4.2 out of 5-star rating on Get Your Guide. Travellers say that this is a nice way to see the city. Some comments report that buses have turned up late and that the stops are not always clear. However, the majority of customers have left 5-star reviews and would recommend this tour. Tickets are visit from first use. Tickets can be refunded by certain suppliers of cancellation is made in advance. Familiarize yourself with Milan in a few hours – take bus tours that reveal layout and top attractions of the capital of Lombardy. Along the way, learn about Milan by means of audio commentary and traverse modern and old areas of the city. Personalize your sightseeing by taking off the bus and rejoining the ride whenever and wherever you like. Lay eyes on one of the most iconic masterpieces of art on a guided tour – learn interesting facts and tales about Milan and its highlights from a certified guide. One of them is Da Vinci’s “The Last Supper,” revealing intriguing undercurrents and what was about to happen if you know where to look and how. Overall, travelers that used the package underline its high value regarding sightseeing and learning. They think that panoramic sightseeing by a hop on hop off bus is a great introduction to Milan before narrowing down the priorities. After reading the comments, it feels like that seeing The Last Supper and learning its story was one of the highlights for many vacationers in Milan. Discover Milan and its top attractions – the Hop on Hop off bus ticket entitles you to explore the city of Milan and get between its attractions in an effortless and informative manner. The validity of the ticket is 48 hours, and during that time you are free to organize sightseeing the way you like. Follow the footsteps of football players – Giuseppe Meazza is the name of the football stadium where spectacular games take place. FC Milan is one of the biggest Italian and European clubs, and this combo ticket allows you to explore the stadium as a guest of honor. Tour premises reserved for players, officials and fans while benefiting of the priority entry. The combo ticket is an excellent tool for fans of football and sightseeing to combine nice and useful. Travelers that were the holders of the pass think that it offers a great service, with interesting pre-recorded commentary and stops conveniently deployed. The validity period of 48 hours allows you to explore Milan at leisure. It also leaves enough time for combining a visit to Giuseppe Meazza Stadium, a must-see for fans of football. Travelers had a great time while discovering the city of Milan on an informative sightseeing tour by bus. Comments posted by the majority of them indicate that taking the hop-on hop-off tour is an excellent way of exploring Milan and learning about the city. They have a good opinion about the overall service for the most part and state that the price is worth the experience. Some holidaymakers advice future holders of the ticket to buy a two-day pass for the best value for money.